Rainbow Riches is a 5 reel, 20 payline slot game with a 95% RTP. This UK Online Bonus Slot comes with Wild and Scatter symbols. The max win on Rainbow Riches is 250 000 coins. Feeling lucky enough to grab the 250,000 coin jackpot win on the 5 x 3 reel online slot by Barcrest? The 20 Pay line slot has plenty of exciting wilds & features along with a 95% RTP. Play Rainbow Riches on Money Reels today which is home to over 550+ slot games. Our other top games include Starburst Slot, Bonanza, and Wolf Gold. All game designers have their own Flagship game, and Rainbow Riches is certainly Barcrest’s! It may not be the flashiest or most innovative slot around today, but the irresistible charm of the online slot is hard to resist for many online slot players at Money Reels. Once you come to understand the unique and exciting bonus features Rainbow Riches has to offer, you’re definitely going to want to check it out! Expect the unexpected with Rainbow Riches, if you’re a first-time player you’ll be wondering why it has taken so long for you to unravel the charm which Rainbow Riches has to offer. 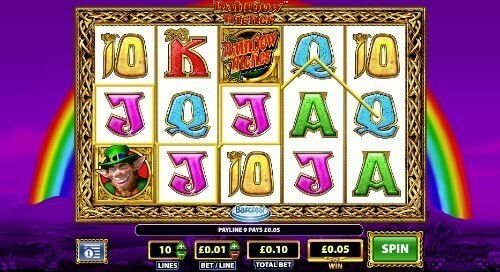 Rainbow Riches is one of the most popular online slots in the UK. Even though online slots were a digitalisation of traditional one-armed bandit slot machines, the game has made it back into pubs and other entertainment complexes across the country! But if you don’t quite feel like leaving your sofa for the chance to win significant amounts of cash, then Rainbow Riches is the perfect option. Even though the game is slightly dated now, it has been optimised as an iPhone and Android slot! Which means you won’t lose out on any of the quality when it comes to the graphics or the soundtrack to Rainbow Riches! Rainbow Riches is set in the Emerald Isle, although the main gameplay will happen over a deep purple sky which has set over the luscious lands of Ireland. The game wouldn’t be really worthy of its name if it didn’t have a rainbow in the background either would it? The reels are featured slap bang in the centre of the reels in a metallic Celtic frame where you will see the 5 x 3 reel grid. What many players love about Rainbow Riches is that everything you need to know is right there on the screen. You get the full visibility of how many lines you are betting on, how much your stake amount is for each bet line and your total amount. This helps you to keep track of what you have used, you also get to see your jackpot amount at the bottom of the screen, and it won’t be long before you start to see quite the collection of coins after you’ve won on the generous online slot! Unlike with other Irish themed games, there’s no soundtrack, so, if traditional Irish music isn’t for you, good news, you’ll only have to hear the sound effects as the reels spin. Each time you hit spin, you’ll be treated to a charming sound – which can only be described as the sound a leprechaun would make while granting you a wish. Now, it has to be said that the leprechaun in Rainbow Riches isn’t the cutest one that you’ve ever seen! In fact, it looks awfully similar to the Leprechaun from the horror film, but Barcrest has created a more accurate depiction of the devilish little creature which has been rife throughout Irish mythology. Generally, leprechauns were pesky little scamps who would only give you money if they were captured, or more accurately, they would give you three wishes in exchange for their freedom. That sounds like a fair deal, right? Well, Barcrest has been even more generous with what you could stand to win with their most popular slot yet! There are plenty of opportunities for an instant cash grab, including two wheels of fortune side games which will definitely brighten your day if they are triggered! The symbols on Rainbow Riches incorporates some of the old school standard slots amongst the wilds and high valued symbols. Amongst the lower valued symbols, you will see A, K, Q, J, and 10 along with the logo of the game, the terrifying leprechaun, the wishing well and the pot of gold. A 95% return to player rate certainly isn’t the highest RTP featured on the catalogue of games featured on Money Reels. Yet, there are many more perks to Rainbow Riches! You’ll still be able to experience wins regularly enough, but what really excites players about Rainbow Riches are the special bonus features which are enough to treat you to a life-changing sum of money, or, maybe just a trip to Ireland to celebrate your massive win. With the ability to win up to 500x your original stake amount with Rainbow Riches there’s plenty to play for. So just how do you win big with the perpetually popular online slot? As with any online slot you’ll have to be fairly patient before you see the bonus features treating you to large amounts of money but compared to some games they are still pretty easy to trigger! Triggering the Road to Riches Bonus feature is simple, and it will delight many players of traditional slot machines. All you’ll need to do is spin the reels and land three Leprechaun scatters symbols. They don’t need to appear in a certain place or on a certain bet line, they can appear anywhere! When this happens, you’ll be taken away from the main gameplay and whisked over to a bonus screen which will present you with numerous multipliers in a wheel of fortune style game. Hit spin and the wheel will start to turn. The needle will land on one of 6 numbers, or the ‘collect’ option. If you hit the ‘collect’ option, it’s game over. However, a number will move you on a certain number of steps in the side game. The multiplier which will boost your coin balance will depend on which number you finish the game on. The progressive style of the game which just keeps on giving is one of the main reasons why slot players can’t resist Rainbow Riches no matter how many new Irish themed games with charming leprechauns are produced. The Wishing Well Bonus Feature is just as easy to land as the Road to Riches Bonus Feature. Yet, instead of landing the leprechaun symbols you will need to land three or more wishing well symbols on the reels. After the wishing wells have landed, you will need to select one of the wishing wells. Each one of the wishing wells will be hiding multiplier underneath! The multiplier will then be applied to your total stake amount! The Wishing Well Bonus feature may not give you the chance to keep on winning as the first bonus feature does, but still, there’s a lot to be said for having three for the price of two bonus features. Which brings us onto the third and final bonus feature of Rainbow Riches! To trigger the Pots of Gold Bonus Feature, 3 pots of gold will need to land on reels 2, 3, and 4 – this will activate the most graphically spectacular bonus game which Rainbow Riches has to offer. You’ll see the leprechaun – who you’ll either come to love or fear depending on what he gives you in the bonus round. The ominously charming leprechaun will be standing upon a rock in the middle of a field. Above his head there will be 12 spinning pots, all of these pots contain different values. You won’t get a choice with this one like you do with the Wishing Well bonus feature. Instead, the spinning pot which stops with the arrow pointing towards it will be your prize. The prize will be rewarded as a multiplier which is then applied to your original stake amount. We did warn you that Rainbow Riches wasn’t your average slot, so, this means that there’s no expanding or sticky wilds, and sadly, there is no free spins bonus to be had either. Yet, Barcrest did release a free spins version of Rainbow Riches which we will go into more detail about below. In fact, Barcrest have released a series of online slots in an attempt of recapturing the magic of Rainbow Riches! There aren’t many online slot companies that can say that they have been operating since 1968. Of course, back then Barcrest weren’t creating online slot machines, the internet wasn’t even a thing back then! Instead, they made a name for themselves by developing games for arcades and bingo halls which included traditional-style slot machines for the UK gaming sector. After they established themselves in the UK, they then went on to dominate the European gaming industry. It was 3 decades later when Barcrest made sure that they were on the forefront of the digitalisation of…everything. It was in 2006 when they put their in-house design team to work, and they cooked up some of the best slot reel players had ever seen! Rainbow Riches allowed Barcrest to establish themselves as one of the leaders in the online slot world. In 2011, things drastically changed for Barcrest when they were acquired by the gaming giants Scientific Games. As we said earlier, there are a fair number of online slots which were brought out as sequels to Rainbow Riches, each of the games have their own certain appeal, we’ve done our best to cover the pros and cons of each game to make it easier to choose the slot which is best for you! With eight different variations of Rainbow Riches, Barcrest have left you with plenty of choice when it comes to enjoying the rainbow as you spin the reels. The Rainbow Riches series may be the biggest series of themed slots there is online! Rainbow Riches came 7 years after the original game and addressed the slightly poor return to player rate which Rainbow Riches offers players. There’s a 98% return to player rate on the 5 x 3 grid set up which offers 20 bet lines; the same as Rainbow Riches, however the max jackpot amount will be slightly lower at 12500. The perks include the free spins round, and the Big Bet feature which is just one of the fun and inventive bonus games offered by Rainbow Riches Pick n Mix slot. Even though Rainbow Riches Fortune Favours was brought out by Barcrest in 2018, the graphics don’t seem to have had much of an overhaul, they may be a little crisper than what you get with the original Rainbow Riches, yet Barcrest have chosen not to change the cartoonish and cute set up of the online slot. The 5 x 3 slot game offers a 97.7% return to player rate, and the game offers the same jackpot size as Rainbow Riches with the 250,000-coin max jackpot amount although you will get fewer bet lines to play on as Rainbow Riches only gives you 10 different fixed pay lines. Other perks come in the form of the wild bonus game, gamble feature and other standard bonus games. Rainbow Riches Drops of Gold online slot was another 2018 release from Barcrest in the Rainbow Riches series, and some may say it’s the best yet! With a 97.75% return to player rate you will experience very frequent wins and if you were let down by the small number of bet lines offered by Rainbow Riches, then you are sure to appreciate the 200 fixed bet ways which the 5 x 4 grid slot offers. The jackpot amount to Rainbow Riches Drops of Gold is the same as the original with 250,000 coins the maximum you can cash out on. There’re also free spins to be won. Rainbow Riches Drops of Gold definitely didn’t hold back when it came to making sure that there were plenty of bonus features. Rainbow Riches Drops of Gold definitely got plenty of people talking in 2018. Casino Beats added the online slot to their list of four games which were predicted to elevate SG’s portfolio – and reel spinners definitely agreed! Rainbow Riches Reels of Gold slot game is a 2016 release with a 96% return to player rate, 100 bet ways and a 250,000-coin jackpot. Yet, Reels of Gold is potentially the biggest mix up of Rainbow Riches. Instead of just having one set of reels, Barcrest has treated you to two. The first reels follow the standard 5 x 4 grid set up while the second reel, which appears by the side of the first reel is set up over a 5 x 12 grid. Reels of Gold also comes with its own magical fairy who will help you to trigger one of the many bonus rounds including the free spins round. It definitely is a unique take on Rainbow Riches, so if you’re looking to switch up your Irish reel experiences, look no further than Reels of Gold. As you’d expect, Rainbow Riches Home Sweet Home has a homelier feeling. Home Sweet Home is one of the latest additions from Barcrest to the Rainbow Riches series after releasing it in October 2018. The medium variance game offers a 97.75% return to player rate over a 5 x 5 reel set up, the jackpot amount is the standard amount which Rainbow Riches tend to pay out at 250,000 but there are 50 different bet ways and plenty of bonus features which will help you to not feel too bad amount jumping ship to Home Sweet Home. Expect bonus symbols, bonus features and free spins bonuses a plenty from Rainbow Riches Home Sweet Home. When it comes to Rainbow Riches alternatives, there are none quite as tempting as Rainbow Riches Free Spins, the name of the online slot is a pretty big giveaway on what the major selling point of the game is. Although the original gave you plenty of bonus features, it was noted that the lack of free spins was a massive downside. The game was released in 2017 with a return to player rate of 97.7% which beats the original by 2.7% although you’ll only have 10 pay lines to bet across, but Barcrest were kind enough to keep the standard jackpot amount for their games at 250,000 coins. If the Leprechauns were your favourite feature to Rainbow Riches, prepare to be charmed by the sprightly creature with Rainbow Riches Leapin’ Leprechauns, you might even want to do a little jig yourself if you cash out on the 20,000 coin jackpot. Leapin’ Leprechauns technically isn’t even an online slot game. Instead, the set up to the game is more like playing a game of Sonic the Hedgehog or Mario Bros. You will see the leprechaun making leaps and trying to get higher and higher on the screen, for every 5 successful leaps, you will receive a reward. The rewards definitely aren’t shabby either thanks to the special symbols which you can collect on your way to boost your wins. Although you will need to look out for the pesky snakes and other symbols which can make your Leapin’ Leprechaun fall back to the starting point. But it’s not long before they are back on their feet again and leaping to the skies. Rainbow Riches Leprechaun’s Gold is yet another ode to the charming Leprechaun by Barcrest which gives you 5 different bet ways. The game is set to be a sequel to the Rainbow Riches Leapin’ Leprechauns slot which will be released in 2019 by Barcrest. The jury is still out in terms of gameplay but there are still plenty of people who are excited by the release. As there are quite literally hundreds of copies and clones of Rainbow Riches by other game developers, it will be hard to touch on them all. However, it is Pragmatic Play’s Leprechaun Song which is one of the biggest rivals to Rainbow Riches. The 3 x 5 reel slot set up offers 20 different fixed pay lines and a higher return to player rate of 96.46%. There are scatter symbols and wilds a plenty with three different bonus features including around which will offer you free spins along with a multiplier. As we mentioned previously, Rainbow Riches wouldn’t have got very far if it wasn’t a good game to play on mobile. The slightly dated yet breezy and charming graphics will look just as good squeezed onto a four inch screen, just make sure you turn up the volume to be treated by the entrancing sound effects which will make your gameplay experience that little bit sweeter. Any Android or iPhone handheld device with the ability to support HTML5 shouldn’t struggle, if anything, Rainbow Riches is one of the best games to play on mobile, there are no high-intensity graphics for your phone to keep up with, making Rainbow Riches the perfect game to play if you like spinning the reels when you’re on the go.